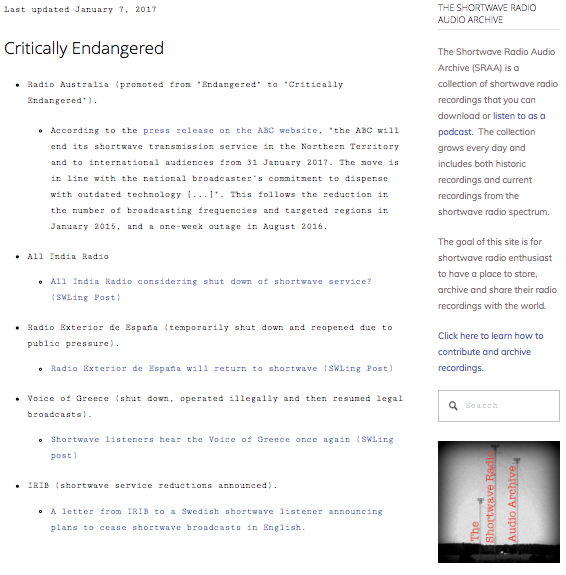 Endangered stations list on The Shortwave Archive website. Need to add Radio Tirana, Albania. Sole transmitter has severe problems, and is reported off the air lately. The webcast has been sporadic. It should be pointed out that R. Belarus does have some relays via Germany, probably not by its own initiative. Radio Kuwait --- recent reports that they are getting transmitters refurbished, so maybe will be back. Amazonia is back with two transmitters functioning well for some time now. [New Zealand], they turned one transmitter off permanently, but the remaining one is on full schedule, partly DRM. Perhaps you should mention that some stations survive, only thanks to WRMI putting them on SW: such as R. Slovakia International, Radio Prague, Radio Ukraine International. I am sure WRMI would be open to doing more of that. It would be sad to see Radio Tirana go, but not entirely surprising, since they have had multiple outages and transmission problems over the past three years. At the same time, it would be great to see Radio Kuwait back on air, and it's also good news that we can take Radio Nacional da Amazonia off the "vulnerable" broadcaster list.